Now you can incorporate solar lights into the electrical grid and provide years of efficient, maintenance-free lighting. Our standard GridSmart combines the reliability and exceptional performance of LED lamps with advanced solar power generation. GridSmart provides monitored/measured power to your local utility during the day instead of charging batteries. Excess power (produced minus consumed) can be claimed as carbon credit or solar credits. 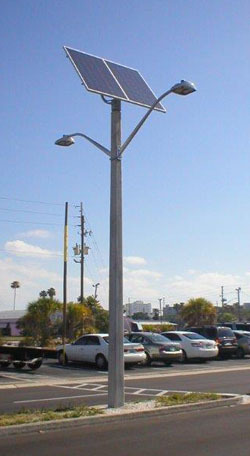 GridSmart is a unique, Made-in-America product especially designed to meet the demanding performance and lighting needs of roadway engineers, the military, landscape architects, and outdoor lighting professionals.